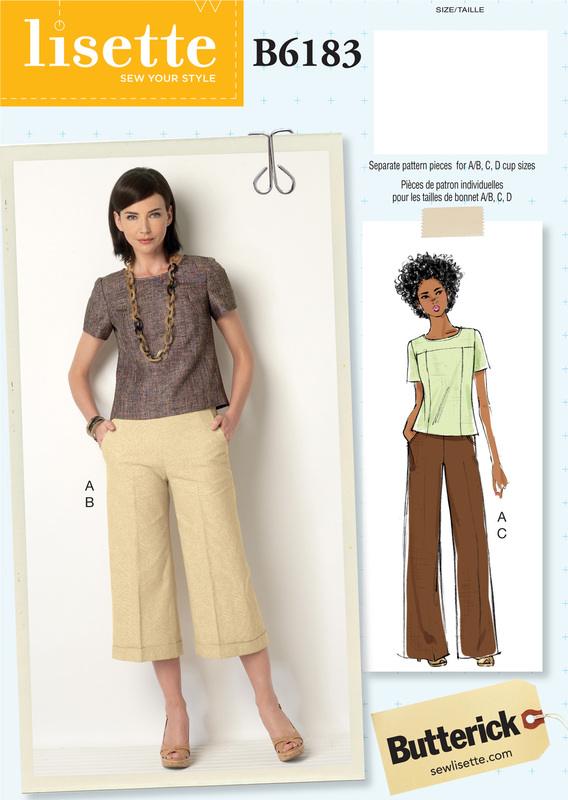 This is the other half of the pattern we discussed last week, the cropped trousers from B6183. I think I say this about many of our patterns, but this is such a classic, versatile style. 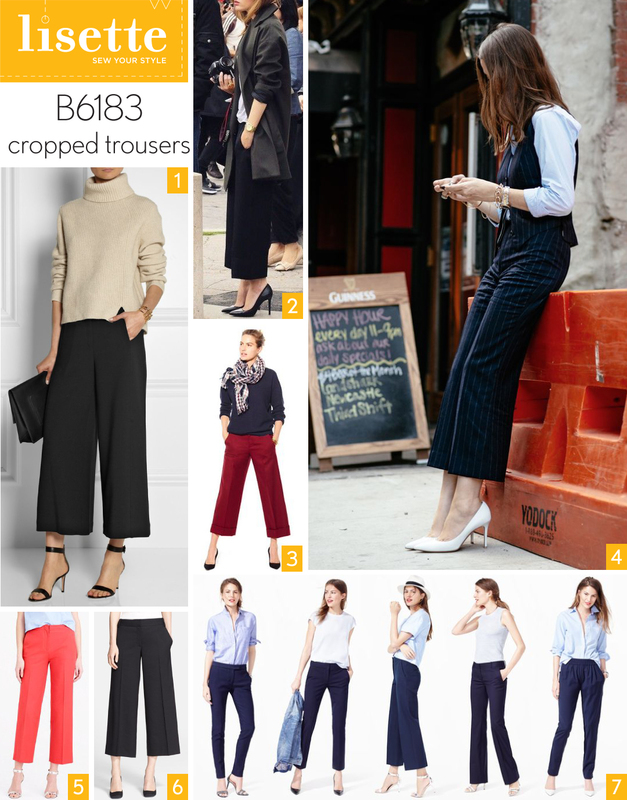 We haven’t seen much in the wide-legged trouser department in the past decade or so, which is such a shame because it’s a really flattering style for so many women. Think Katherine Hepburn’s iconic style and it’s always wide-legged trousers. These aren’t quite as wide as Kate’s, but they’ll give you a really nice line and will look good on lots of bodies–not just the lanky angular type. As with most clothes, this style is all about the proportions. When cropped, the hem should be at least a couple of inches above the ankle. You can go shorter with them, too, as you’ll see below. I love everything about this. The boxy sweater, the strappy heels. Come on, spring! 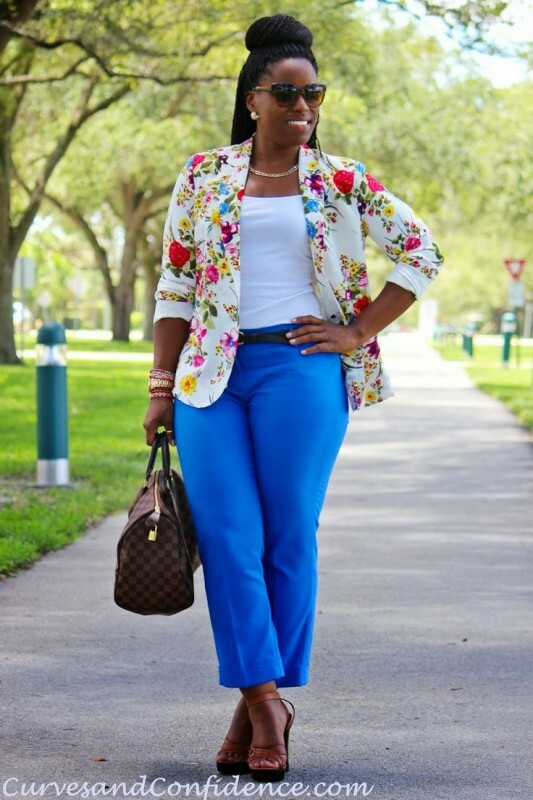 They’re cute with black pumps and a long jacket, too! Marsala, anyone? I love the Pantone color of the year because it works so well with camel, gray, navy and all my favorite basic colors. The pinstriped fabric is such a fun play on the classic power suite. For spring, why not a bright coral or red pair of trousers? Cropped trousers even work with ballet flats. 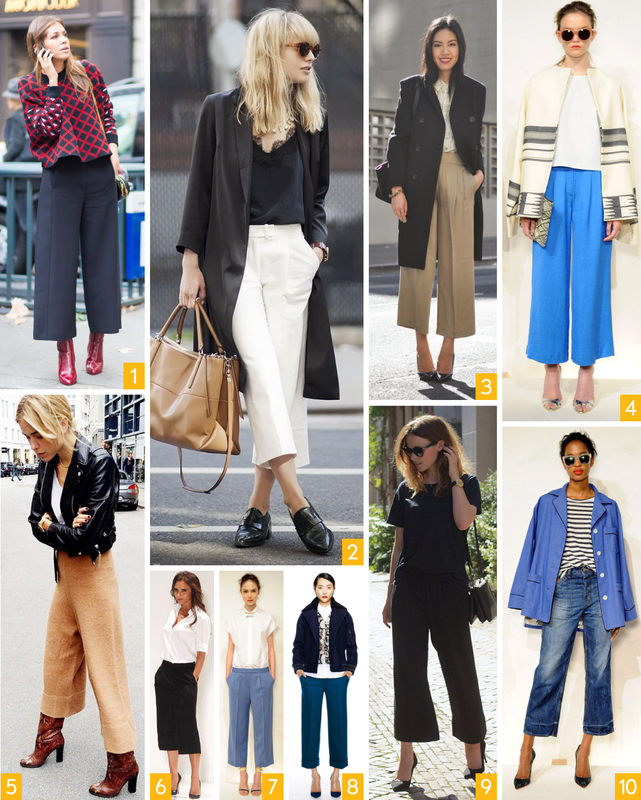 Of all the different pant silhouettes available right now, I think the cropped wide-legged trousers feel the freshest. We haven’t seen them in a long time and they’re such a classic shape. Worn with a boxy top, this is a great silhouette for a lot of body types because it highlights the waistline. Make them in white or cream for spring. In this photo and the next photo, I just adore the long jacket! It really pulls an outfit together. I’m planning to make myself one using our Weekend Getaway Dress pattern, so stay tuned for details if you’d like to make one for yourself! I’d call this a completely fresh take on khakis. Aren’t they fun in fuzzy camel? I like them with the boots, too. This would be a great winter look for those of you in the southern hemisphere approaching winter. Crop to just a few inches below the knee for more of a skirt look. This would be really great for a business setting: a crisp white blouse and skirt/trouser combo that’s a fresh take on the classics. Here’s the whole outfit from the pattern: the slightly boxy-but-fitted cropped top with the full cropped trouser. I just love this silhouette. And why not denim? I had a similar pair years ago and I wore them until they fell apart and Todd was embarrassed to be seen with me. I think I may just make a new pair! Are you noticing the shoes? A heel or a classic menswear-inspired brogue is the way to go here. You could do a ballet flat if you want, too. And before I go, here’s a darling pair of cropped trousers in bright blue for spring to show you that they work for curvy girls, too. I’m sort of leaning toward an updated khaki for my first pair. Robert Kaufman makes this really interesting tropical bi-stretch fabric I want to try. (The color is less red in real life.) And I might tackle denim later. What do you think: neutrals or color for your trousers? Any, by the way, are you planning on joining any of the upcoming sew-alongs on the Lisette blog? I hope so. I have my fabric all picked out (you can see what I’ll be using here), and I’m excited to sew through these styles with you. Are the Lisette patterns available at Jo Ann stores? I am looking forward to trying these pants. I’d like some of the lighter colored neutrals, or the denim, although I find the bright blue and dark pinstripes to be appealing options as well. I am worried about sizing though, how to get a good fit to my proportions. Chicmamainedh, I’ll be talking at great length about finding the right size in the Lisette patterns tomorrow. I hope that will help? I love a good wide-legged trouser, I always feel so glamorous in them. You’re right, it’s that movie-star look. I have always loved the wide leg trouser for my business attire. I was very excited to see this pattern release.